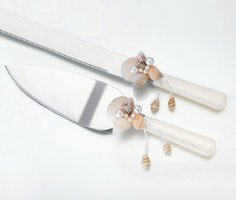 This set includes one 12" long cake knife and one 9.5" long cake server. The handle is made of cream acrylic. The Ribbon Diva offers a large variety of elegant Wedding & Prom Supplies.